Environmental Working Group's research team collected labels from 173 bottled water brands and called dozens of bottled water companies to find out which ones are willing to tell customers what's in their bottles. The brands below earned a spot on EWG's Shelf of Shame for hiding data some of their competitors freely shared. Aquafina Purified Drinking Water (Pepsi) - Our water quality tests are not for the public. The label includes this helpful note: "Product Questions? call 1-800-432-2632." But the Aquafina representative who answered EWG's call was less than helpful, saying that the water quality information is "proprietary" and "not for the public." (PepsiCo, Inc., Personal Communications, Aug. 27, 2010). Gerber Graduates Lil’ Water Purified Water - Please tell us what's in the water we sell. The label says: "For questions or a report on water quality and information, contact 1-800-4-GERBER or GERBER.com." But when EWG called that 1-800 number, the Gerber representative said she didn't know whether a water quality report was available. She said she would pass our question on to the "help desk" and they'd call us back (Gerber, Personal Communication, Aug. 27, 2010). They didn't. EWG called them back on Nov. 30, 2010. This time, the representative who answered said he did not know what a water quality report was or what it would say. He called back the same day, saying that we had misread the label. Gerber, in fact, has no water quality report. Instead, the phrase on the label, "For... a report on water quality," means that consumers should call the company to report any issues with the water's quality. Oregon Rain Natural Virgin Water - Our clouds avoid populated areas. The label tells an incredible — really — story: "100% rainwater. Over the Pacific Ocean, where fresh, cold air from the North Pole meets warm air from the equator, clouds dripping with naturally clean, pure water are produced. These clouds travel from the ocean, avoiding populated areas and arrive over the Willamette Valley. There on a specialized farm, Oregon Rain captures the water, passes it through a one-third micron filter and ozonates it in the bottle. The result is truly Heaven in a Glass." Market Pantry Purified Water (Target) - Our bottle says what? Really? The label says, "For a report on water quality and information, contact: Guest services 1-800-316-6151 or Target.com." EWG's call to that 1-800 number was answered by a perplexed company representative. He said that he didn't know that Market Pantry's bottled water labels directed consumers to this number and did not have a water quality report (Target Corp., Personal Communication, July 16, 2010). EWG was unable to locate a water quality report on the website indicated on the label (www.target.com). Bristol Farms Drinking Water - Water quality report? Never heard of it. The label says, "For information relating to water quality including a bottled water report, contact Chameleon Beverage Co. 800-989-2028 [email protected]" But the representative who answered EWG's call seemed confused by our request for a water quality report. He had "never heard this request before." He said the company does several tests daily on its water and therefore has many, many test results. He offered to schedule a tour so that EWG could see the bottling process but said he was unable to provide an annual water quality report (Bristol Farms, Personal Communications, Aug. 27, 2010). Archer Farms Natural Spring Water (Target). - Target's wild online goose chase. The label on this Target brand says: "For a report on water quality and information, contact Guest Services 1-800-316-6151 or Target.com." EWG could not find an Archer Farms water quality report on that website. A Target representative admitted that the report was "not currently set up on target.com" (Target Corporation, Personal Communication, July 17, 2010). 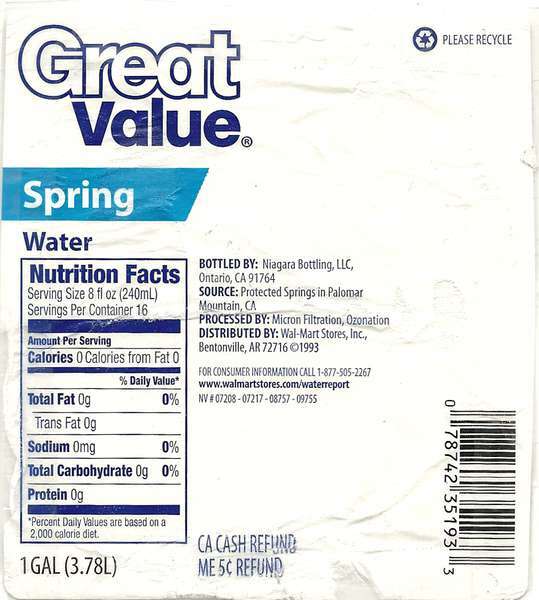 Great Value Spring Water and Great Value Purified Drinking Water (Walmart). - What water quality report? When EWG called the phone number on the label, the company representative said she was not aware of any water quality report she could send to us (Walmart Stores Inc., Personal Communications, July 15, 2010). We called again on Nov. 30, 2010. The Walmart representative again said she knew nothing about a water quality report but promised that the manufacturer would call us directly within a few business days. On December 14th we finally received an email from the Magnetic Springs Water Company with the promised water quality report, five months after our first request. 7 Select Spring Water (7-11) - We'll call you back. But not any time soon. 7-11's bottled spring water label includes this note: "For more information and to obtain additional consumer information relating to water quality including a bottled water report, go to www.niagarawater.com or contact Niagara at (877)ITS-PURE." EWG called the number, asked for the bottled water report and was told that the request needed to be handled by a different department that would call us back (Advanced H2O LLC, Personal Communications, Aug. 27, 2010). The promised return call never came. EWG called again on Nov. 30, 2010. This time the representative knew more and directed us to an online water quality report. Essentia Purified Water - Water quality report coming soon - we promise. The label directs consumers to the company website (www.essentiawater.com) to get water quality information. But when you go there, the company just promises it in the future: "Essentia will post a quarterly lab analysis prepared by an independent laboratory for your review and reassurance... PDF Download [of lab analysis] to come" (Essentia, 2010). This lack of public data doesn't stop the brand from boasting of health benefits: "Doctor recommended to protect, improve and enhance the quality of your health... Essentia is a prescription for life." Trader Joe's Pure New Zealand Artesian Water - You wanted an email address that works?! The label gives consumers an email address — [email protected] — to get information on water quality. But EWG's emails to this address were returned with a delivery failure notification. Alhambra Jr. Sport Crystal-Fresh Purified Water - Looking for water quality information? It's "coming soon." 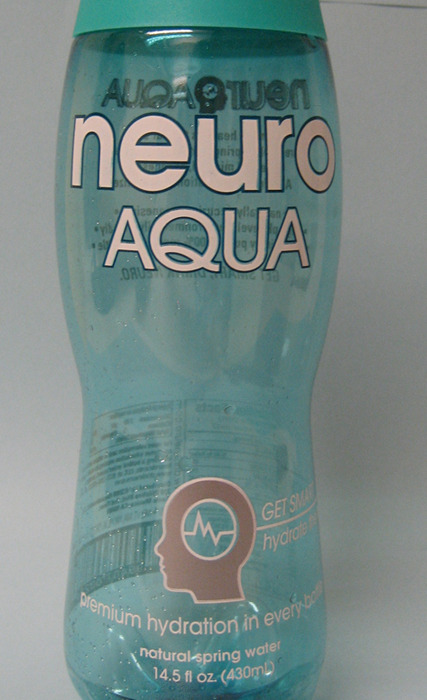 The label directs consumers to a website (www.jrsportwater.com) for water quality information. But the website has only two things: a picture of the Jr. Sport products and a “coming soon” banner. Fiji Natural Artesian Water - Purified by equatorial winds (and mechanical equipment). On its website, Fiji claims that its water comes from rain "purified by equatorial winds after traveling thousands of miles across the Pacific Ocean. Winds that carry acid rain and pollutants to other parts of the planet just don't come [their] way" (Fiji, 2010). In its water quality report the company describes a far different process relying on mechanical filtering — not winds and ecosystems — and divulges that the water is "filtered to remove any particulate matter, micron-filtered to remove microbiological particles," adding that "ultra violet light is applied to insure disinfection." 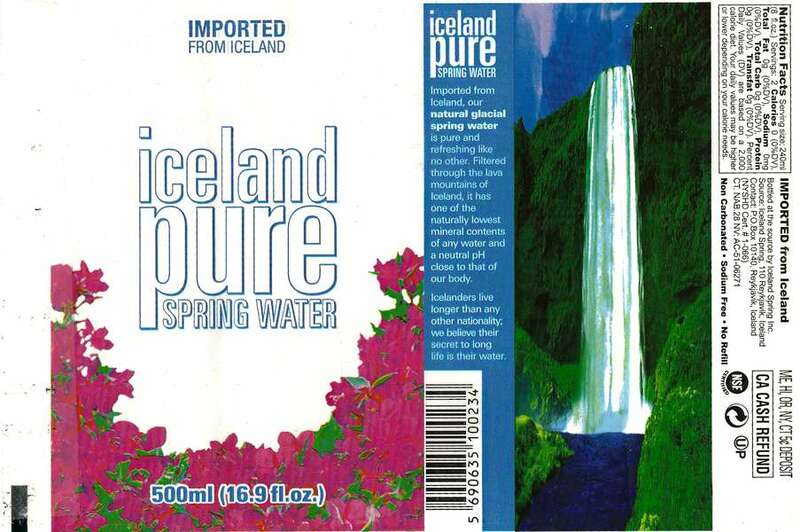 Iceland Pure Spring Water and Iceland Spring Natural Spring Water - The secret to long life? Good luck finding out. The label says "Icelanders live longer than any other nationality; we believe their secret to long life is their water." But the company keeps its water quality tests secret, with no online report and no contact information on the label. H2Om Natural Spring Water - No special potions (or water quality report), just positive thinking. The website says: "H2Om has everything to do with what you believe in. After all, that’s what makes it interactive, your thoughts, while you drink it. We don't add special potions, or bless the water before we deliver it to you, once you buy H2Om at the store, you let the label inspire you as you put your own belief and personal energy into it. At that moment two things happen, as you create your own personal intention while you drink in the delicious spring water, you are living in the "now", and you are naturally in a grateful state of being. You’ve created an energetic interaction with the element that sustains your life. Your body is completely receptive... And logically, as you absorb the water, you carry that "intent" with you throughout your day. H2Om is Positive Drinking with Positive Thinking" (H2Om, 2010). 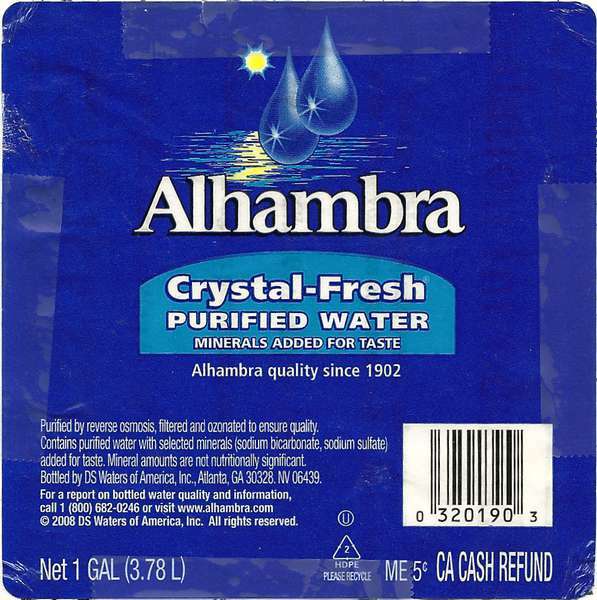 The company does not use advanced purification methods and does not provide an online water quality report. Angel Fire Water Drinking Water - Purest mountain source, trust us. The label says, "What you hold in your hand is water that is bottled from the purest mountain source," but it does not disclose how or if the water is tested or purified and does not say how to get water quality information. The company does not publish a water quality report on its website. Essentia Water Inc. 2010. Essentia: Lab Analysis. Available: www.essentiawater.com/resources_lab_analysis.html [accessed July 9, 2010]. Fiji. 2010. 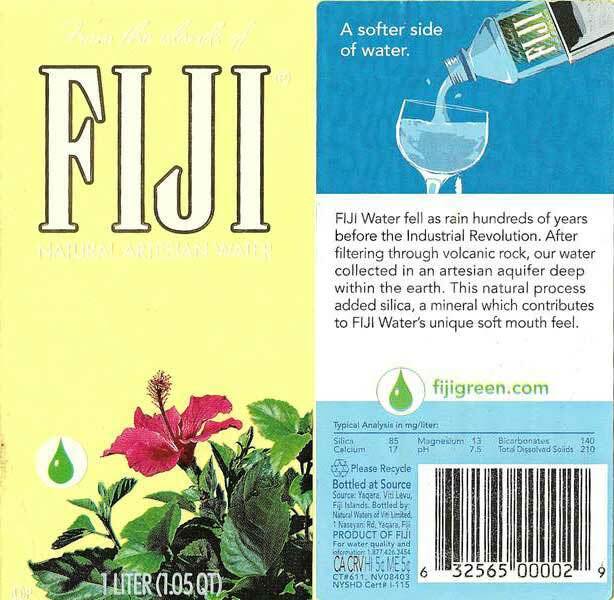 Fiji Natural Artesian Water: What Ecosystem is your Water from? Available: http://fijiwater.com/Ecosystem.aspx [accessed September 22, 2010]. H2Om. 2010. H2Om: About Our Water. Available: http://www.h2omwater.com/index.php?option=com_content&view=article&id=46&Itemid=53 [accessed November 29, 2010].